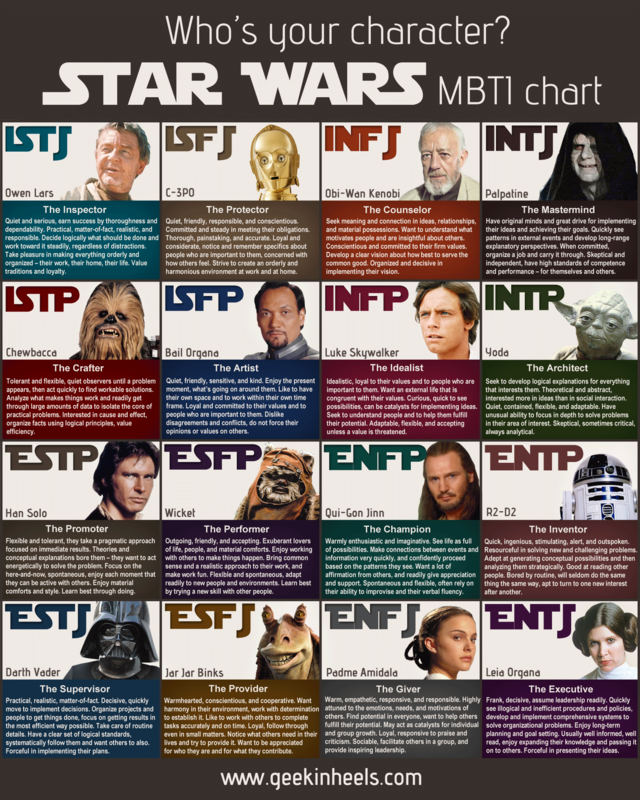 It’s a Star Wars Myers-Briggs Type Chart! I’m Owen Lars. Which one are you? I’m Palpatine. Aside from the whole evil take over the galaxy thing, it seems to fit me pretty well. On the Harry Potter version of this chart, I’m Snape—which is the character I have the most negative feelings toward (outside of Voldemort, of course) in the entire series. Luke Skywalker… didn’t see that one coming. I am Bail Organa – the Artist. I love to be artistic be it with paper and pencil (or computer keys!) or occasionally with paints. I’m jealous you got him! He was one of the few redeeming qualities of the prequel series—I wish there had been more of him. Reblogged this on TamBorgia's NaNoWriMo. I went through and did the MBTI test for the heroine and each of her four potential romantic interests in my story in progress, and on a couple of them, they didn’t come out as the correct personality type (that’s the kind of result you get when it’s a short test with only yes/no answers). So I went through on a site that gives really good descriptions/explanations of each type and figured out which ones best fit the characters as I need them to be. It was an interesting and fun exercise!